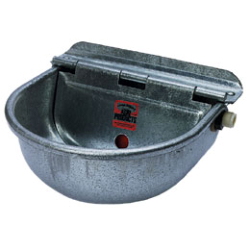 These all-purpose waterers work well for horses, cattle, hogs, and dogs. Safely operates between 10 to 70 PSI. Constructed from heavy gauge, prime draw quality steel. Can be easily installed at any height using lag bolts or U bolts. Will fit a ½” pipe with a left or right connection.